In 1955, Tony Reuter, a member of the long established gang known as the Elephant Boys or the Elephant Mob from the Elephant & Castle area of South London posed as a Teddy Boy for one of series of articles in The People Newspaper on London Gangsters. Whilst some members of the Elephant Mob did wear the Edwardian fashion and that some members of the gang were amongst the first Teddy Boys in England, it turns out that Tony Reuter was actually never a Teddy Boy at all! 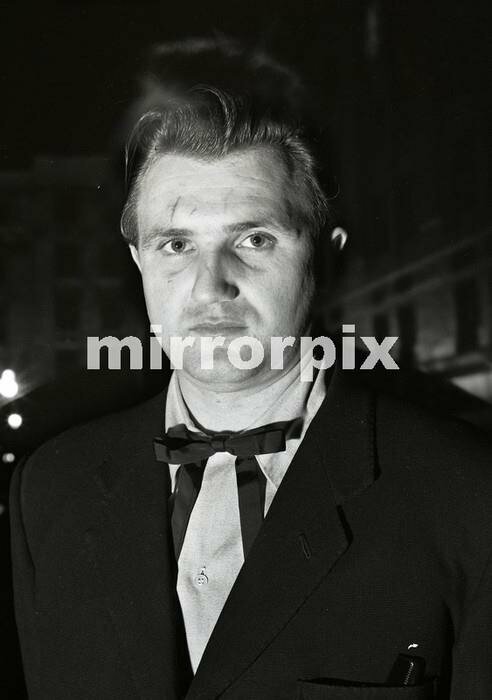 Tony Reuter photographed for the People Newspaper article The Teddy Boy Horror - "I Confess" in 1955. In 1955, Tony Reuter, a member of the long established gang known as the Elephant Boys or the Elephant Mob from the Elephant & Castle area of South London posed as a Teddy Boy for one of series of articles in The People Newspaper on London Gangsters. 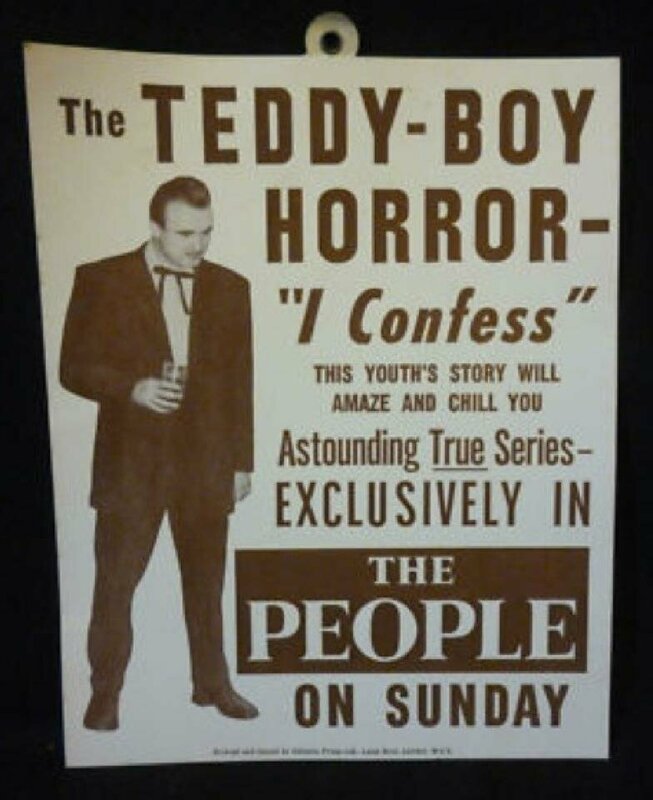 The People advert for the article The Teddy Boy Horror - "I Confess" which was published in 1955. It is true to state that some members of the Elephant Mob did wear the Edwardian fashion and that some members of the gang were in fact amongst some the first Teddy Boys in England. However, in Brian McDonald's book, 'Elephant Boys', it is revealed that Tony Reuter was not actually a Teddy Boy at all and was partially dressed up purely for a newspaper article as part of a series on London Gangsters in 1955. 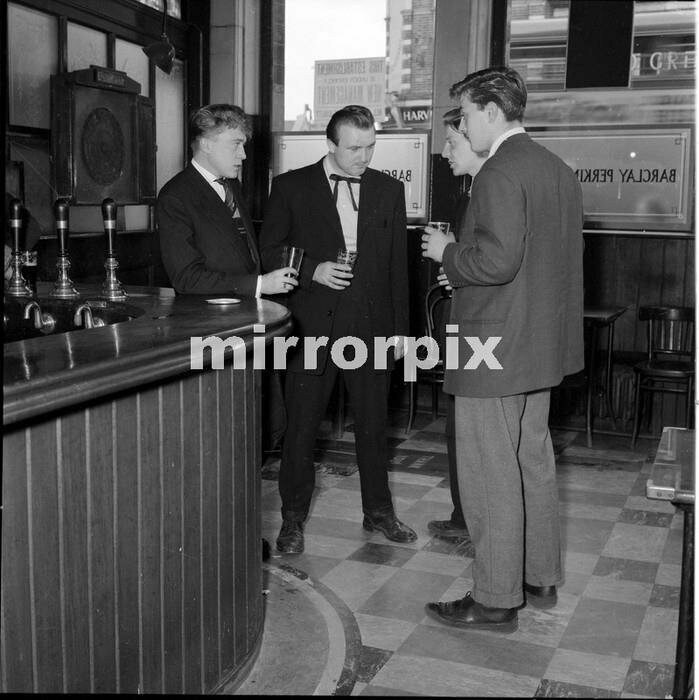 Members of the Elephant Gang pose with Tony Reuter (2nd left) having a pint in a local Pub in 1955. The lads were always out to make a few bob. Tony Reuter and some others collected a nice fee from The People newspaper for sitting as reformed characters on a bench at Billy Graham's first evangelist meeting in London. They were simply rounded up by the paper and taken to the meeting. I don't believe Billy Graham had anything to do with it. The Sunday papers often ran a series on London Gangsters. The People was the most productive. Over the years the Sundays provided stories on West End villains Jack Spot and Billy Hill who were contesting control of the London underworld. Both drew their support from the tough areas of London and the papers serialised the underworld scene including a number of south London boys, Johnny Carter and Frankie Fraser, who were gaining their reputation as the power behind the thrones. Tony Reuter shows off his knife to members of the Elephant Mob in 1955. Tony Reuter, who was married to Johnny Carter's sister, was on the run at the time for his attack on the constable at the Elephant. 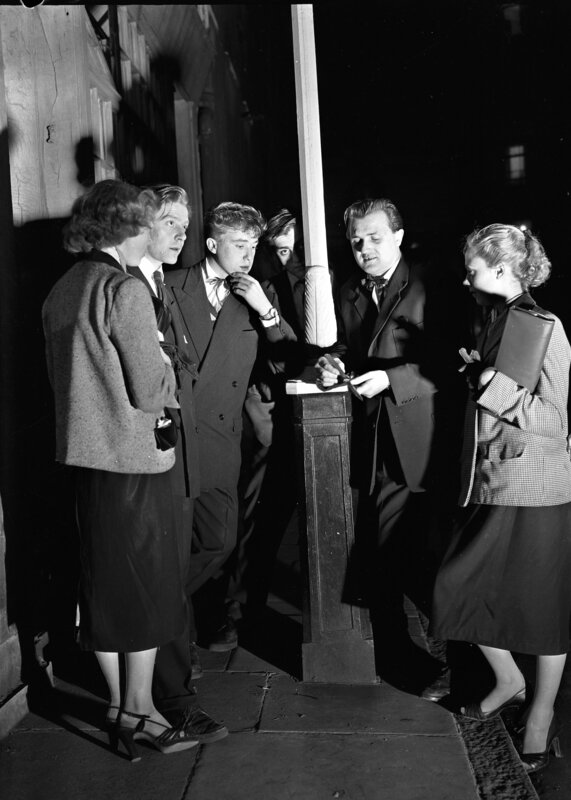 The People published a story entitled 'A Teddy Boy Confesses', a colourful description of the 'King of the Teddy Boys', by Tony Reuter, which followed his contrived appearance at Billy Graham's evangelist event at Wembley Stadium. Tony was never a Teddy Boy - he held that overdressed fraternity in contempt - but he is reputed to have earned £500 for his story. 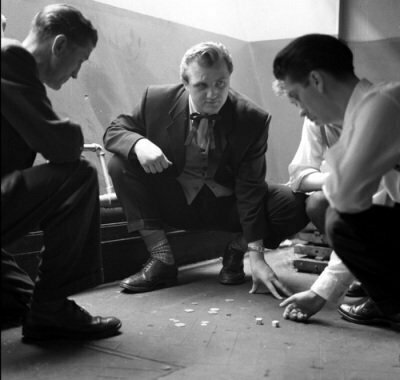 Tony Reuter playing Dice with members of the Elephant Gang - a popular game played in the 1950's for money. The serial, presenting him as a reformed character, only ran two editions: when he went to collect his money from the people offices, the Police were waiting for him and arrested him for the attack on PC Anthony Stills. The following week a notice appeared in the paper saying that due to legal reasons the episode would not appear. They never did finish it. Incredibly he got bail, which he didn't answer to, costing his Mum and one of the Denis's £100 forefit. When the Police caught up with him again, he went away for five years. 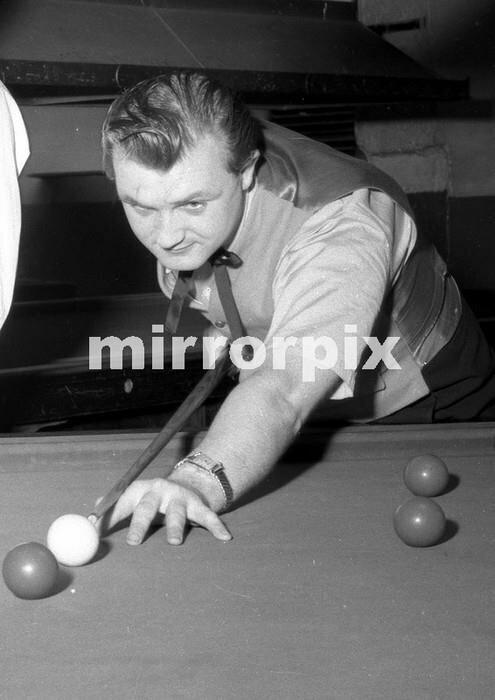 Tony Reuter plays Snooker in a local Elephant & Castle Billiard Hall in 1955. All of the Elephant Gang were snappy dressers. Suits cost roughly the equivalent of two weeks' wages or more. They were made to measure by excellent tailors on the basis of a deposit and some of the balance paid at each of the two fittings with the remainder paid on collection. The style varied but was never outlandish with generally two buttoned conventional suits. When the Edwardian fashion came in it became a three or four buttoned three piece suit without velvet collar, although this sometimes appeared on overcoats. Fashionable materials at this time were mohair or twenty-two ounce worsted in say clerical grey. Just try to buy that material nowadays. Amongst notable tailors were Harris and Hymies, both in the Cut near Blackfriars; Diamond Brothers at Shaftesbury Avenue; Sam Arkus in Berwick Street, Soho; and Charkham's of Oxford Street. 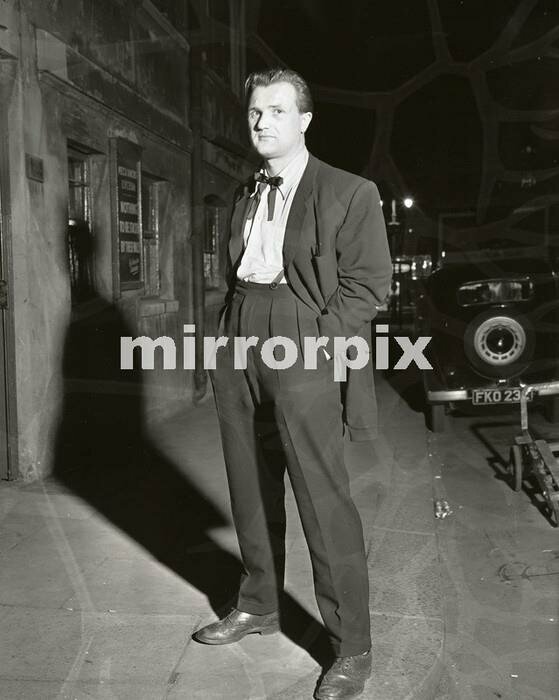 Tony Reuter poses for effect - a menacing look for the People newspaper in 1955.